Within the Tibetan Buddhist cycle of life there is birth, ageing and disease, and death. Long term signs of decay can be observed through dreams, thoughts and actions, and physical appearance, and also through messengers (in Tibet if a patient was too ill to see a doctor in person, they would send a messenger). 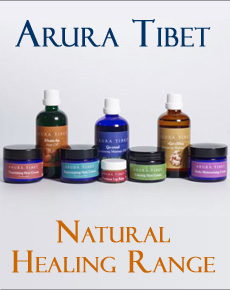 In Tibetan medicine dreams are characterised into six types. Seeing dreams – this type of dream occurs when you have seen something in the day time and then you dream about it that night. Hearing dreams – this type of dream occurs when you have heard something in the day time or just before going to bed. The dream is then influenced by that sound. Feeling dreams – when asleep you feel a soft, hard, light or heavy material and the physical sensation associated with this can influence the content of your dream. Praying dreams – this type of dream occurs when you strongly wish or pray for something to happen and then you dream about it. Dream of disease – when you are unwell and sick you then also dream about sickness and illness. Negative dreams occur when the channel of consciousness is blocked by the disruption of the three nyes-pas. Because of this the functioning of mind and body becomes disturbed and this leads to negative dreams. Negative dreams can include the following - riding on a cat, monkey, tiger, jackal, corpse, buffalo, pig, donkey or camel whilst naked and proceeding in a southerly direction. Also negative are dreams of having a bird’s nest on top of your head, a tree growing from your head, a thorny tree growing from your heart, a lotus flower blooming out from your heart, falling from a precipice, sleeping in a cemetery, skin peeling and falling away from the limbs, entering the womb, drowning in mud and being carried away by a flood, being swallowed by a fish, finding precious stones, getting married, sitting naked whilst shaving or cutting your hair, partying with deceased relatives, wearing red clothes, being dragged by dogs. If these are dreamt continuously around the time of dawn then they can be interpreted as being long terms signs of physical decay. Positive dreams can include wearing clean white clothes, carrying ceremonial banners, the enthronement of a king or queen, meeting your spiritual masters, witnessing a big fire burning, seeing a clear blue ocean, finding apricots or walnuts, climbing high mountains or onto the roof of a house, climbing a tree abundant with fruit, riding a lion, elephant, horse, or riding cattle, swimming across rivers, travelling in a north easterly direction, escaping from prison or from dark caves, dreaming of gods and goddesses, being praised by one’s parents, or performing a religious ceremony. If these are dreamt constantly and at dawn they can be interpreted as being indicative of good health, long life and material gain. These dreams are a warning sign if they are dreamt constantly around the time of dawn, otherwise the above five do not necessarily mean anything. If a person’s thoughts and behaviour change dramatically, from being calm to being violent or from being violent to calm, from being shy to talkative or from moody to happy, these are all signs of long term physical decay. In our community in South India we had a neighbour who was in the Tibetan army and who was in his mid-forties. Normally he was very serious and unapproachable, however one year there was a village party and he surprised everyone by dancing continuously and singing all night. I remember that at the time my mother remarked that this was not normal and that it was not a good sign. She was right as shortly afterwards the man died suddenly. Similarly if a person suddenly begins to criticise their physician, spiritual teacher, friends and family, and if as a patient they refuse to take any medicine, these are signs of decay; as is quickly gaining a lot of wealth. With regard to these signs I had a patient who was a devoted Buddhist for many years and who I had treated for quite some time. Suddenly he completely changed his attitude towards his teacher and began to heavily criticise him, he also complained about the medicines he was taking from many different physicians. He told me his dreams and that he had nightmares, and he also told me that he felt certain he was going to die. Although he was only a young man he did in fact die very shortly after this. Signs to do with appearance can be that when after bathing the region around the heart is dry whilst the rest of the body is still wet, the soundless cracking of knuckles when usually there is a sound, the non-appearance of a body shadow in the sun, a headless reflection in the mirror or water, a reflection with limbs missing and the distorted appearance of sense organs such as mouth and ears. As when you see a flower on a fruit tree you know that the fruit will grow, or when you see a dark cloud you know it will rain, it is the same with these appearance changes in that they are the long term warning signs of decay. With regard to seeing signs in the messenger this was relevant to medical practice in Tibet when it was not always possible for the ill person to see the physician due to the vast distances involved. Therefore a messenger in the form of a friend of family member would be sent to see the physician on the ill person’s behalf. If the messenger is in a panic when they reach the physician, looks nervous, and arrives on a date which is astrologically inauspicious, these are also seen as signs of decay for the patient. Short term signs of decay can be observed in connection with the five elements and five sensory organs, and their dissolution in the human body. Earth is absorbed by water and vision becomes blurred, water is absorbed by fire and causes the bodily cavities to dry up, fire is absorbed by air and there is loss of bodily heat, air is absorbed by space and respiration ceases. Short term signs of decay are also observed in the diminishing of the powers of the five sensory organs, this is seen by observing various external physical signs. The sense of sight diminishes, vision becomes blurred, and the eyes roll upwards. Hearing diminishes the patient is unable to hear anything and the ears become cupped. Smell diminishes the patient is unable to smell anything and the nostrils become distended. Taste diminishes the patient is unable to taste anything and there is loss of speech, the tongue becomes dry and black in the middle, the lower lip hangs down and the upper lip rolls upward. Finally the sense of touch diminishes and the patient is unable to feel anything. From the Tibetan Buddhist perspective this is now a crucial moment for deciding the patient’s future rebirth, therefore it is very important that the patient has a calm mind. In Tibetan communities spiritual practices such as reciting and reading from Buddhist scriptures like the Bardo Thodol would be performed in order for the patient to die as peacefully as possible. Uncertain signs of death occur when inauspicious dreams arise during illness, however when the illness ceases so do the dreams. Certain signs of death are, internally when the patient is unable to take food, externally when there are only bones and no muscle tissue, no pulse beat, and no response to any form of treatment. In Tibetan society it is also vital for a qualified physician to be able to detect and correctly predict impending death in order for the family of the deceased to make the necessary religious preparations. Tibetans believe in rebirth and the period of 49 days after death is crucial for the deceased with regard to their next life. The next life rebirth of the deceased really depends, however, on their actions in the life which has just ended. For Tibetans the death of a person is not the end and there is much still to be done to help them. It is looked upon as a good time for grieving for the family and friends; they make every effort to perform various religious rites and ceremonies on behalf of the deceased in order to help them. Evidence that this can help can shown from the life of Tibet’s great yogi Milarepa. Once he was meditating in a cave and that year there was a heavy snowfall for many weeks which blocked the path leading up to it. The local villagers thought he had died and therefore performed the necessary religious ceremonies for the deceased. However after some time Milarepa appeared, much to the astonishment of the villagers who told him they thought he had died, and that they had performed the usual rituals for him as a deceased. He commented that he had not felt hungry during the time they would have had done this. During this 49 day period the family will try not to show too much emotion as Tibetans believe that the spirit of the dead person will still be inhabiting the places of their previous life. This means that when serving tea the cup of the deceased will also be filled, (in Tibetan society each person has their own cup) in order not to upset the spirit. Immediately after death every effort is made by the family to contact a highly realised lama who can perform phowa. This is a method of ejecting the consciousness of the deceased from the body and directing it towards a better rebirth. It can only be successfully performed by a very highly realised practitioner. Astrologers also play an important role during this period. When someone dies an astrologer is consulted in order to calculate the right day for cremation and which Tibetan Buddhist deities are to be supplicated. The astrologer also checks to see if the deceased is still strongly attached to any family members or possessions. With regard to this I have an example from my own community in South India. One of our neighbours died at what was calculated to be a very inauspicious time. Soon after this the young daughter of the man who died said that on a number of occasions she had seen her father. She was then attacked by one of their cows, of which she still bears the scars to this day. It was during this time that my mother had a dream of a new pair of trousers which were in the house of the deceased and which were moving as if someone was inside the trousers. Normally when someone dies, their clothes and possessions are offered to the local monasteries, and in regard to this my mother asked the wife of the man whether she had kept any of his clothes, especially any trousers. The woman was shocked to hear this from my mother as she had left a new pair of trousers which had belonged to her dead husband and which she had intended to give to his brother. The trousers were immediately offered to the local monastery and after this the disturbances ceased. One year after the death of the person there is an anniversary known in Tibetan as Lo Cho when final farewells are said to the deceased, and again religious rites and rituals are performed. 1) When the physician needs to confirm diagnosis they can, for example, confirm a mKhris-pa disorder by giving a decoction of felwort. If the patient responds positively then there is a mKhris-pa disorder. Throughout this process of confirmation the physician should be as cautious as a cat. 2) Once the physician has confidence in their diagnosis they can explain the causes, symptoms and treatment of the disease to the patient, as if they were hoisting a banner on the top of a mountain. 3) Some diseases such as hidden fever require the physician to prescribe a hot potency medicine to bring the fever out. The fever can then be treated with cool potency medication to fully eradicate it. This can be compared to taming a wild horse and putting it in a stable. 4) If the patient comes to the physician after having previously seen another doctor the physician will have to ascertain whether the previous doctor prescribed medication which was either too strong or too mild, or prescribed the wrong medication. For this the physician has to investigate the disease like a gull catching fish. 5) If the disease is very serious, such as fully developed fever, the physician has to act immediately and treat it with the four water therapies which are dietary instructions such as fasting by taking only water and no solid food, cooling conduct by taking cold baths, medicine given such as camphor decoction and surgery performed such as blood letting from the external jugular vein. This is compared to meeting your enemy in a narrow lane where there is no retreat or escape. 6) Minor diseases are treated gradually by advising on diet, behaviour, prescribing medicine and performing surgery. This can be compared to a set of stairs that are slowly climbed one after the other. 7) Individual diseases such as Loong disorders can be treated separately without disturbing either mKhris-pa or Bad-Kan. This can be compared to a warrior destroying an enemy on the spot. 8) Multiple or combined diseases such as combinations of Loong, mKhris-pa and Bad-Kan should be treated with equanimity. This can be compared to a cheftian making peace between two disputing parties. 9) It is very important for the physician to consider the patient’s bodily constitution. Otherwise it is foolish to put the load of a dzo (crossbreed of bull and female yak) on the back of a sheep.